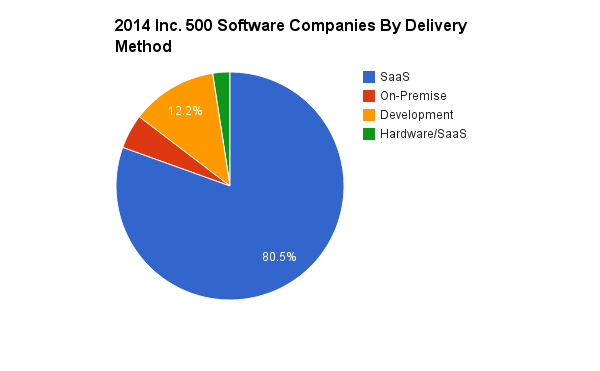 Benchmarking The Inc. 500: Which SaaS Delivery Method is Best? It is a fascinating time to be a student of SaaS. As a delivery method, it continues to gain adoption across industries at an astounding rate. The cloud software market (Software-asa-Service/Platform-as-a-Service/Infrastructure-as-a-Service) makes up $48–$56 billion of the entire $400 billion software industry, meaning that "cloud-based software accounts for no more than 15% of the value of the total software market," according to Altos Ventures. It's clear that these companies have been able to move from establishing initial product/market fit (at less than $1.5 million in annual revenue) into the high-growth phase, increasing revenue by 2,762 percent on average. In fact, only 3 of the 42 companies analyzed recorded revenues greater than $1.5 million in 2010 (Swiftpage $4.3 million, Lab Tech Software $2.4 million, and Coupa Software $2.1 million) and could be considered as having already reached product/market fit prior to 2010 using $1.5 million. I've applied a linear trend line, marked in red. 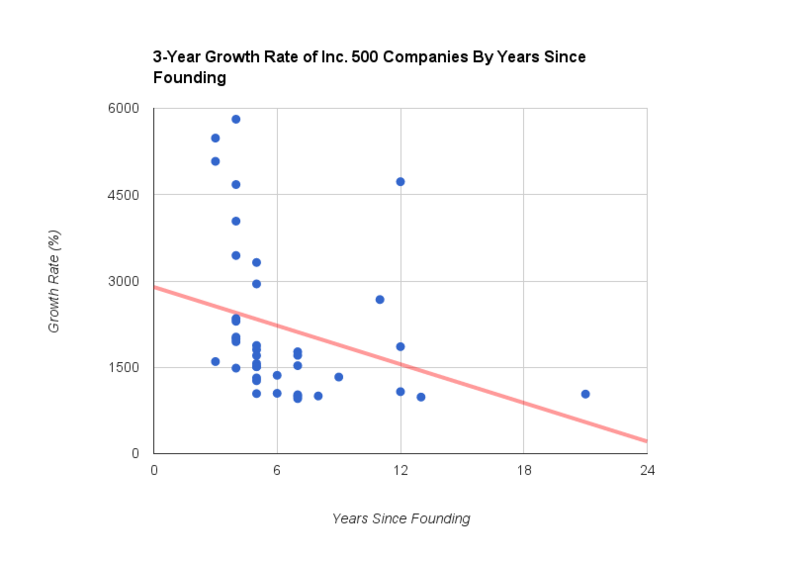 We can see that younger companies, especially those younger than 6 years are growing faster than those founded more than 6 years ago. SaaS companies make up the majority of the Inc. 500 list and represent a disproportionately higher percentage of their sample when compared to the percentage of SaaS companies in the software market as a whole (which we looked at earlier). A much smaller percentage of these companies offer a choice between on-premise software-development services or a SaaS solution paired with hardware. This is indicative of the software industry as a whole moving away from on-premise and into the cloud. As we look at this further, we can see from the 2013 gross annual revenue that SaaS companies are generating the highest gross revenue on average, followed by development vendors, then hardware/SaaS, and finally on-premise. 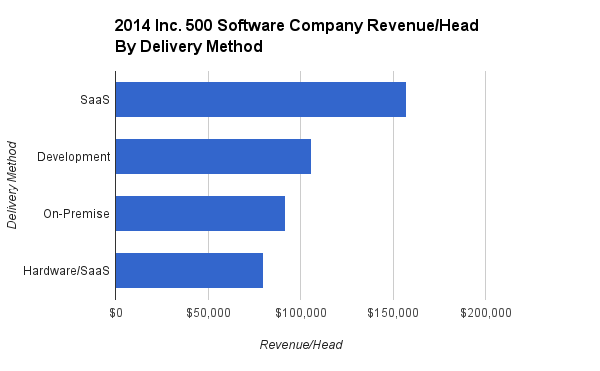 As SaaS companies represent the majority of this sample, the distribution of revenue across delivery methods is impossible to extrapolate from the software space as a whole. 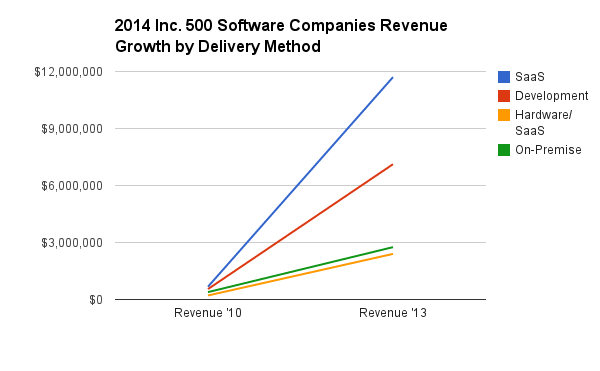 However, it is indicative of the broader trends we've seen in the rise of SaaS as the favored delivery method. Ultimately, many of these metrics supported our hypothesis at the outset of this research that software is taking over the world. 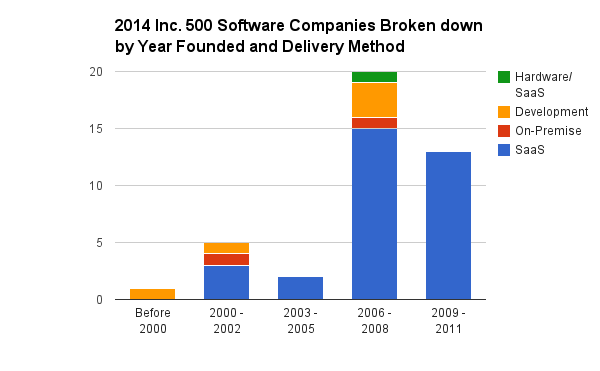 With that in mind, SaaS most certainly dined its way to the top of the Inc. 500 in 2014. This is the first in a series of posts covering our research of this topic. You can read Part II here, where we compare the success of the companies that were able to bootstrap their way to success versus those that received funding.